Sleeping up to four people, The Cotthouse is the smallest of our holiday cottages making it a perfect choice for couples or smaller families. With two bedrooms, lots of social space, pleasant outdoor areas and room for your pets to come too, The Cotthouse is a magical place to relax at every time of year. In Autumn and Winter the cosy log burning stove in the sitting room will become your focal point, a place to unwind and warm yourself after a busy day exploring. In Spring and Summer sunny days will flood The Cotthouse with light and the great outdoors will become an extra room for playing, dining or whiling the hours away with good company and conversation. 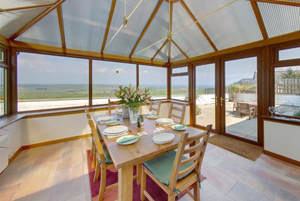 At every time of the year the stunning panoramic sea views from the large conservatory are a joy to behold, so spend some time quietly relaxing and simply watching the world go by. Sitting Room: A woodburning stove is a feature of this comfortable room, which also includes a television with Sky, DVD player and music system. 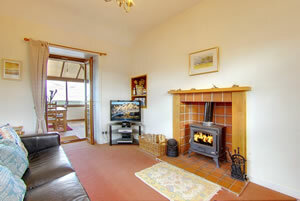 Conservatory: Beautiful, large conservatory next to the sitting room offers stunning panoramic views. 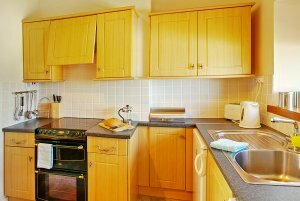 Kitchen / Diner: Fully fitted modern kitchen equipped with electric cooker, microwave, dishwasher, fridge / freezer, kettle, toaster, automatic washing machine, iron and ironing board. 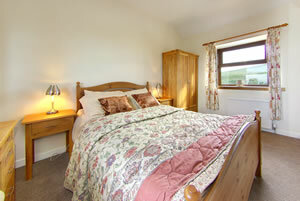 Double Bedroom: Spacious bedroom with wardrobe and clothes storage. Bunk Bedroom: With adult-sized bunk beds and clothes storage. Bathroom: Modern family bathroom with large modern shower cubical . Patio Area: Enjoy the outdoors - fully enclosed in own private grounds with comfy furniture and barbecue. 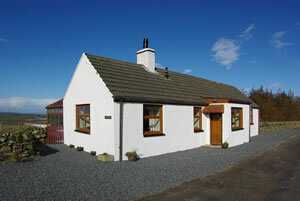 Comfort: The Cotthouse enjoys quality furnishings, equipment, double glazing and central heating throughout. Pets Welcome: Well behaved pets are welcome by prior arrangement.